Step away from your routine of daily life and embark on a day of rejuvenation and nourishment at the beautiful heritage listed Ormiston House and gardens overlooking Moreton Bay. 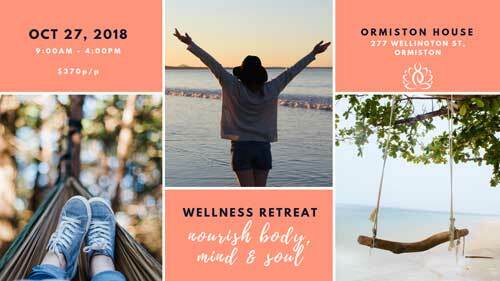 This one-day retreat will support you to find inner peace and a deeper connection to yourself. Experience the benefits of connecting with your inner resources to nurture your body, mind and soul. Step away from your routine of daily life and embark on a day of rejuvenation and nourishment at the beautiful heritage listed Ormiston House and gardens overlooking Moreton Bay. This half-day retreat will support you to find inner peace and a deeper connection to yourself. Experience the benefits of connecting with your inner resources to nurture your body, mind and soul.